No, I haven’t really eat out the past week because I’m trying to purge my body from excess food that I’ll be consuming over this holiday weekend. Sorry, but I’ll make it up next week. I’ve already started baking since yesterday; even though it’s not Thanksgiving yet. It sometimes scares me how much food I’ll end up ingesting over the five days that I’m at home. So far, I baked sourdough bread and orange cranberry muffins for my family for yesterday morning’s breakfast. (If you want to jump to the muffins, click here.) Hence, the idea that it’s round one of baking because the day after Thanksgiving, I’m baking cookies and mantou (a Chinese plain, white bun). Oy. I’m already imagining the weight I’ll be gaining. Anyways, the sourdough bread was an initiative that I’ve taken because of the fact that I finally persuaded my mom to buy lots of King Arthur flour because: (1) It’s on sale and (2) I like the fact that after reading numerous cook/baking books that King Arthur flour has a higher gluten content compared to other brands of all-purpose flour; which makes a crusty bread a bit more chewier. Well, actually I have some King Arthur bread flour from a few months ago that I haven’t finished up, so that went into most of my sourdough starter. The recipe I’ve used it actually a hybrid of a lot of three different sourdough recipes, so I can’t really credit the person or company that created the recipe. 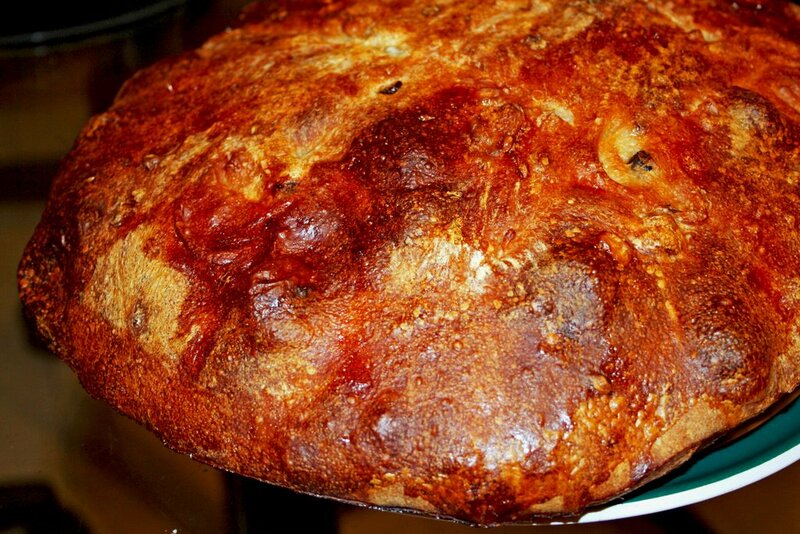 The starter is from King Arthur Flour, the walnut raisin half of the sourdough is slightly adapted from King Arthur, and the plain sourdough was from a fellow blogger, the Foppish Baker. 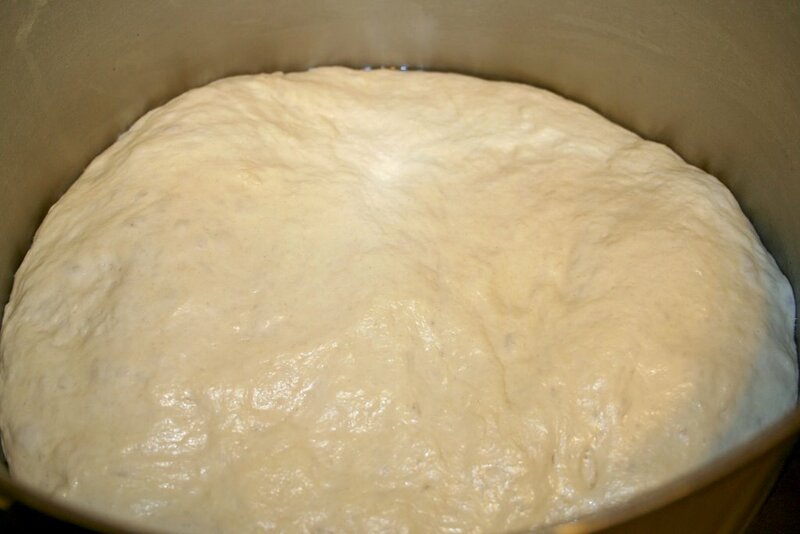 For those of you who don’t really know or how sourdough bread is made, it’s basically two major parts to it but it’s a bit tedious, especially on the first part the starter. 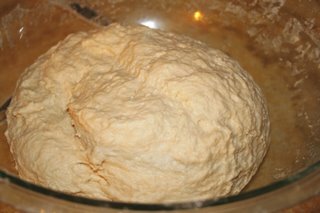 My starter is basically two cups of unbleached bread flour (I used King Arthur but you may use another brand and I like unbleached flour more because there are less chemicals and human intervention with a good ingredient), a package of yeast, and two cups of warm water with a tablespoon of sugar. Mix all the ingredients and let it sit out in room temperature, covered with a clean dish towel. Every morning I feed the starter (I call it the “mom”) with half a cup of flour, same amount of water, and a teaspoon of granulated sugar for the next 3 days. I was actually worried or paranoid that it won’t turn out well but seeing that on Tuesday night; I’m happy. 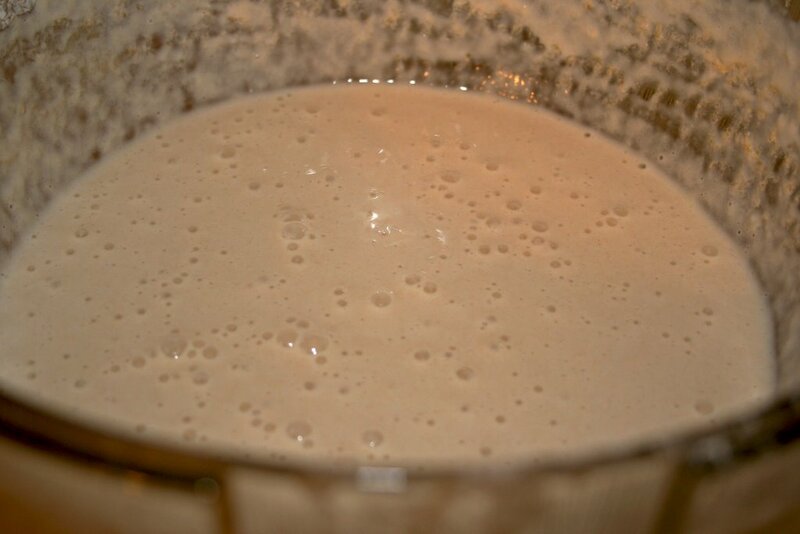 The mom (starter) had a beer, yeasty aroma, and the thickness of pancake batter. Not fruity because of the fact that there’s no fruit to aid in the fermentation, though you may use grapes to start the starter. 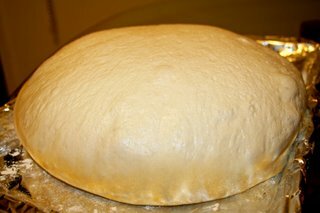 I scooped out a cup of the proof and mixed the flour, water and yeast again, and let it proof overnight to really get the bread making started. From here, I took from the Foppish Baker’s recipe to split the dough into two. 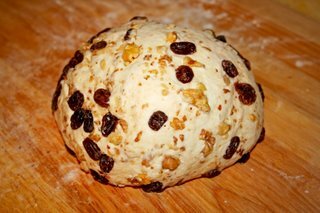 One of the halves will be the plain sourdough and the other will be the raisin walnut sourdough. The plain half was placed into a large greased bowl and covered to let it go to its first proof. 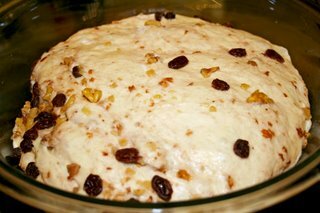 The other half was mixed with toasted walnuts and pre-soaked raisins and then placed into another large, greased bowl for proofing as well. The shaping phase; I thought of sticking with the boule shape because I know that making it into a baguette would be a bit tedious because I know I don’t have the baguette pan to help keep its shape. I don’t have the bannetons (a basket that shapes the bread) because I’m not willing to shell out $30 for something that I don’t use often. 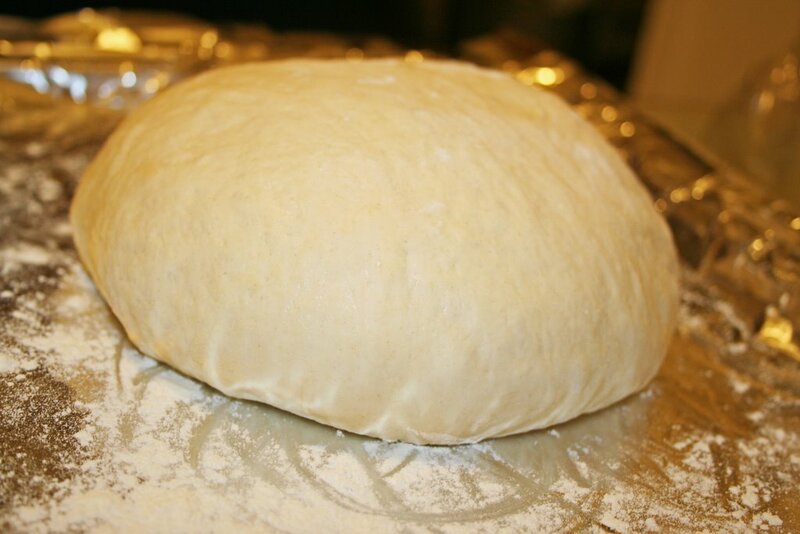 So, it’ll be a free-form boule. I let them proof for the second time and then stick it in the fridge overnight since I’m planning to bake and eat these in the morning. I was actually surprised how huge they were! After taking these photos, I got some sleep and got up 5 AM. Unfortunately, I have to, my mother is one of those people who must eat early in the morning or she’ll throw a tantrum if you don’t feed her. Anyways, I took out the pans of bread and let it sit out while I’m preheating my oven at 500 degrees with a heavy pan sitting on the bottom of my oven and two other sheet pans to act as a baking stone of the oven. 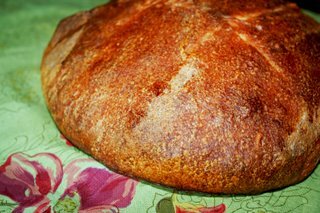 This idea came from Rose Levy Beranbaum’s book, The Bread Bible. 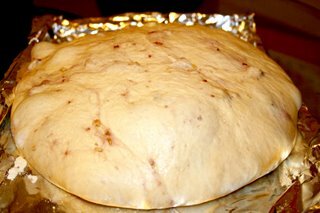 Once I preheated the oven for half an hour or so, I placed both loaves into its own sheet pan and throw in a cup of ice to the heavy metal sheet pan that is sitting on the bottom of the oven. The results were actually good, as you can see down below. I’m really happy with the blistered crust on both loaves but the plain sourdough held its shape better than the walnut raisin. I guess because the raisins were soaked in water, therefore more moisture to the dough. So, my mental note for next time is to knead in more flour for that bread. The crumb texture of both breads had irregular holes! So, I’m very content with that. 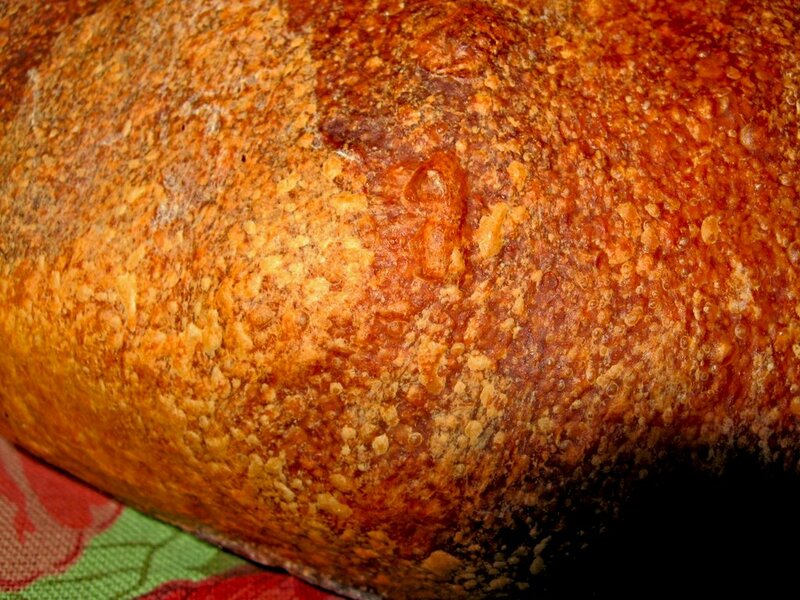 Both loaves had the thin, crisp, almost mahogany in color and the crumb texture is light and moist like those sliced packaged bread one can purchase at a grocery store. The difference between the two is that the plain sourdough had a slightly tangy, yeasty aroma that is almost like a sourdough bread I had in San Francisco, but it wasn’t fermented or proof out long enough for my starter, so it lacked that “sour” taste. The raisin walnut bread is slightly different because of the sweetness that imparted from the raisins and the crunchy nuttiness from the walnuts that gave it an interesting texture to the crisp bread. Overall, I’m pleased with the results for baking sourdough bread for the first time. Briefly, so I won’t kill you from reading so much, I’ll talk about my orange cranberry muffins. It sounds very “fallish” doesn’t it? Cranberries are so ubiquitous during the fall and my mom bought it a few weeks ago, all we did was wash the berries, dried it and freeze it. This recipe is based on Martha Stewart’s blueberry muffins the changes I made was obviously replacing the blueberries with cranberries, added the zest of a medium orange, a teaspoon of orange extract, a 1/4 cup more granulated sugar because of the tartness of the cranberry. Well, now you got a glimpse of my holiday baking craze. I hope you all will be having a good time spending time with your family, if not well, what can I say? I’m just thankful that even though I have some tiffs with my mom, I love my family and I’m grateful that I have what I have. You know what I mean? Once again, Happy Thanksgiving, everyone! I’ll try to eat out next week. ‘Til then, happy eating! I’ve been reading you blog for quite a while, and I have to say that I love it more and more with every post! I spent freshman year at NYU, so many of the places you visit definitely made me homesick – gah, I think I could live off of croissants! It’s nice to know that I’m not the only pastry obsessed individual :) Keep up the awesome posting and Happy Thanksgiving! Kathy – Thanks for loving my blog. :) Ah, I wish we all could live off of buttery pastries so everyone could be happy but it seems our bodies reject the excess amounts of fat ingested. Happy Thanksgiving to you, too! Giulia – It’s really yummy. ^^ The tartness of the cranberries is a good contrast to the sweet, moist muffin.